Description: The Tiffany Dragonfly re-creates Tiffany Studio's most beloved designs in all of its splendor. A Dragonfly flies and dives downward with glowing Golden Yellow jeweled eyes, a Sky Blue tail and delicate Blue, Yellow and Green wings over hand-cut and copperfoiled pieces of a Green and Blue scroll-like border. The Beige Iridescent glass background is separated by White swirled glass pieces and accented with Goldenglass jewels. 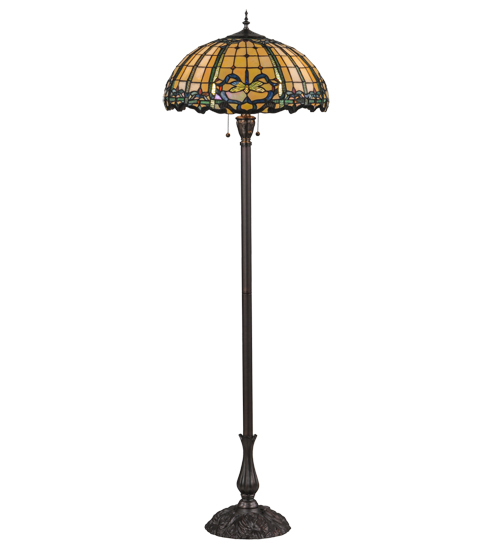 The shade is created with Meyda Tiffany?s famous copperfoil construction process and complemented with a Mahogany Bronze finished floor base.